Harris County, Texas – February 5th, 2016: The Super Bowl is America’s most watched national sporting event. On Super Bowl 50 Sunday, February 7, there will be lots of game day socializing that may include drinking alcohol. That’s why Harris County Pct. 4 Constable Mark Herman and the U.S. Department of Transportation’s National Highway Traffic Safety Administration are urging football fans to call the play now: drinking OR driving. If you plan on drinking on Super Bowl Sunday, designate a sober driver to get you home safely. Harris County Pct. 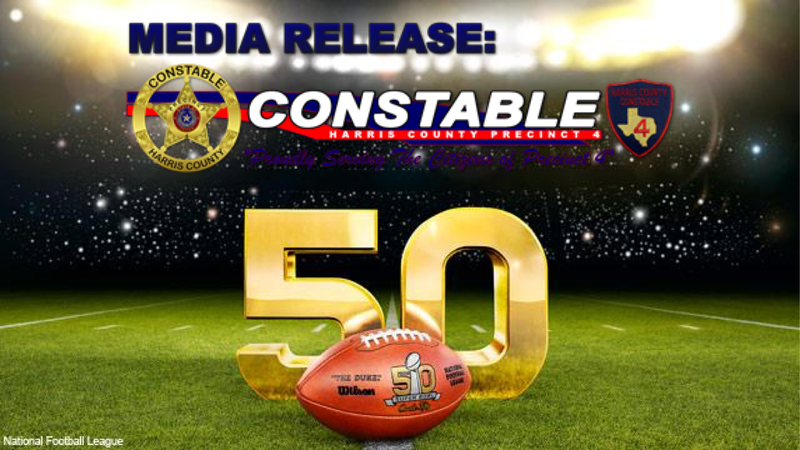 4 Constable, Mark Herman has allocated several extra patrols for detecting impaired drivers in order to keep the citizens of Precinct 4 safe in their travels during Super Bowl 50. Before Super Bowl Sunday, make a game plan that includes a sober driver – someone who will not be drinking at all. Consider getting a sober ride to your destination, so you won’t have the option later to drive impaired. Designate a responsible driver now to help your guests get home safely. Ask all of your guests to designate their sober drivers in advance, or help them arrange ride-sharing with sober drivers. If you don’t drink, offer to drive guests home. Sign up online for a ride sharing service and keep the phone numbers of local cab companies on hand and take the keys away from any guests who are thinking of driving after drinking. Remember, if you serve a guest alcohol and he or she gets in a crash that night, you could be held liable. For additional information concerning this case or suspects, please contact Harris County Constables Office Precinct 4 at 281-376-3472.